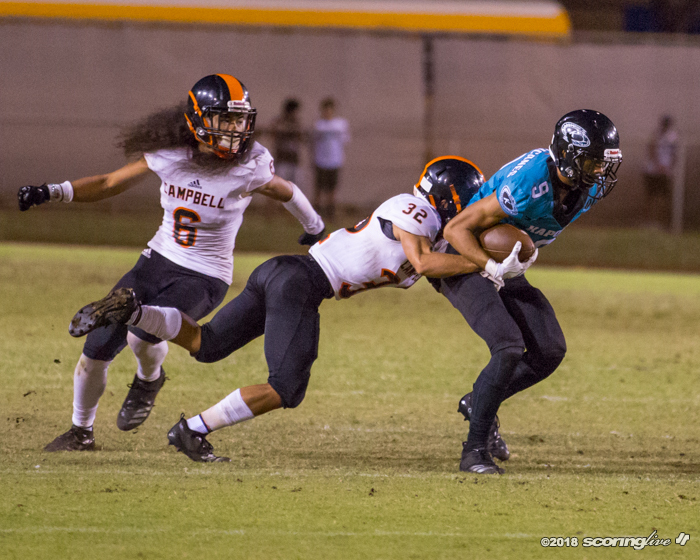 KAPOLEI — Krenston Kaipo passed for 308 yards and three touchdowns and No. 4 Campbell hammered No. 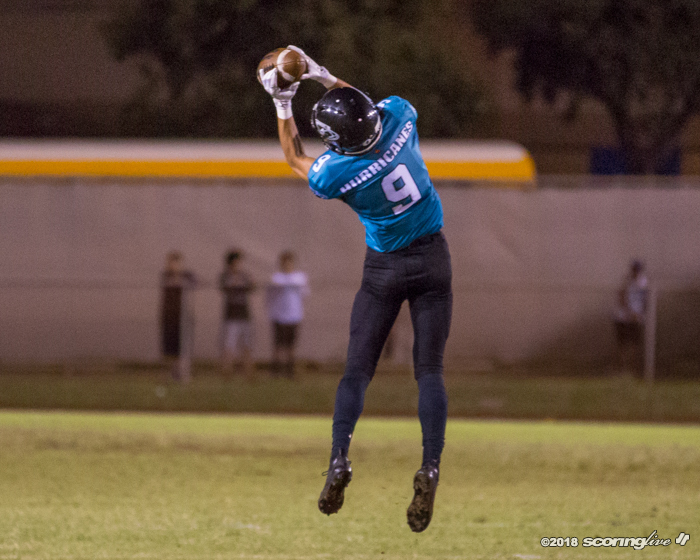 10 Kapolei, 28-0, Saturday night at the Alvin Nagasako Sports Complex. 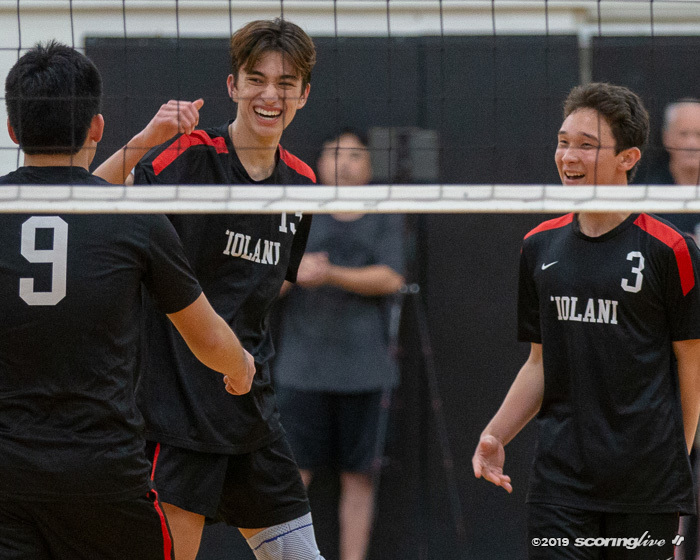 With the victory, the Sabers clinched the Oahu Interscholastic Association Open Division second seed for the four-team tournament. 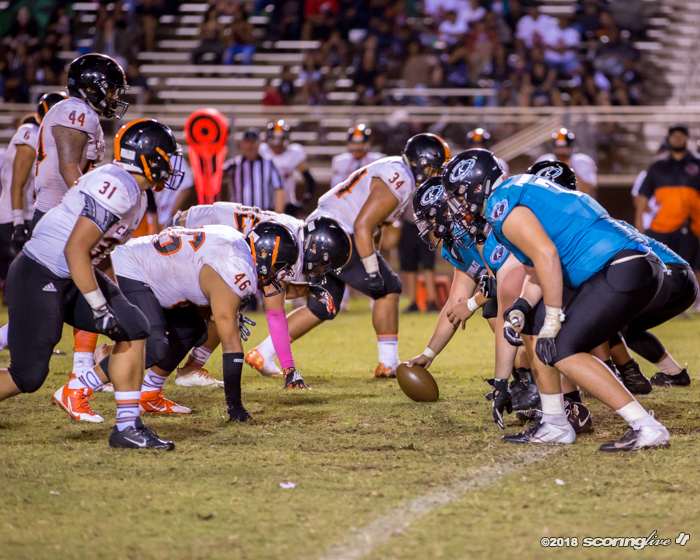 It also means they will host a first round game against the third seed. 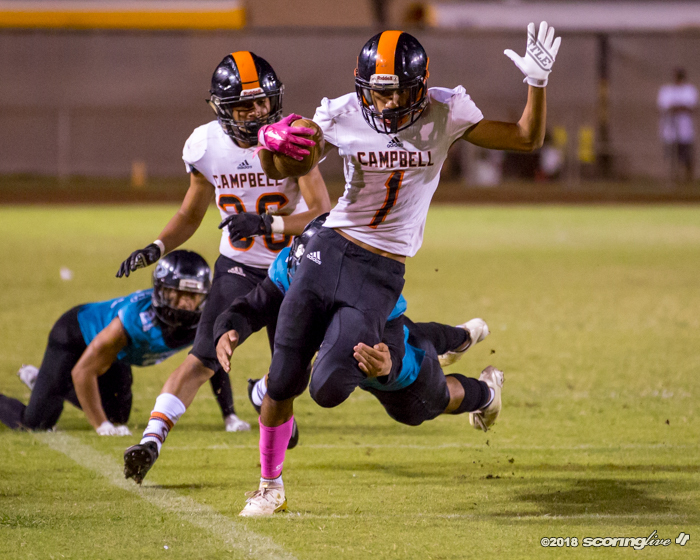 Campbell improved to 6-3 overall and 3-1 in the OIA. 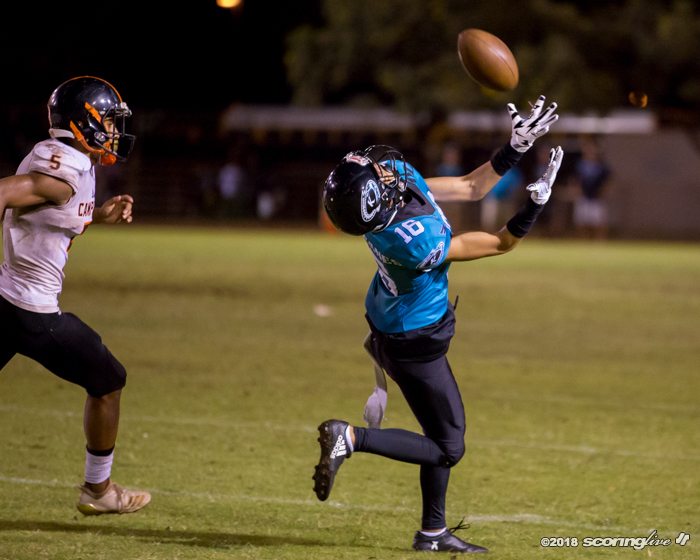 It closes the regular season next week at Waianae. Also, the Sabers claimed the Sledge Hammer perpetual trophy that goes to the winner of the cross-plain rivals. 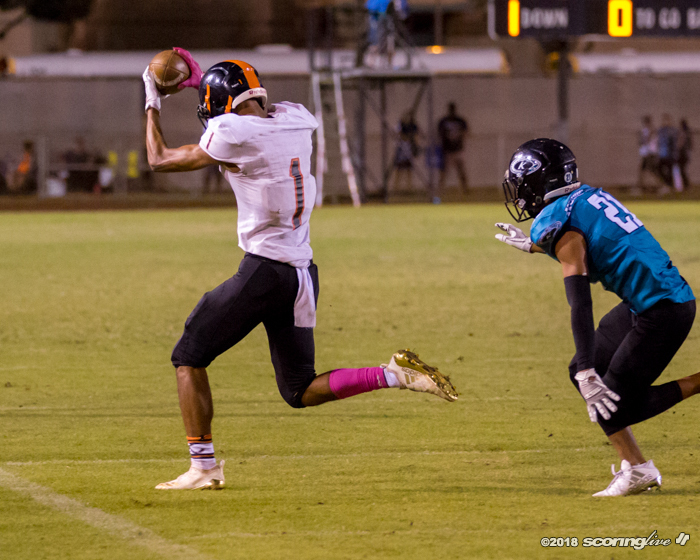 The Hurricanes dropped to 3-6 and 1-3. 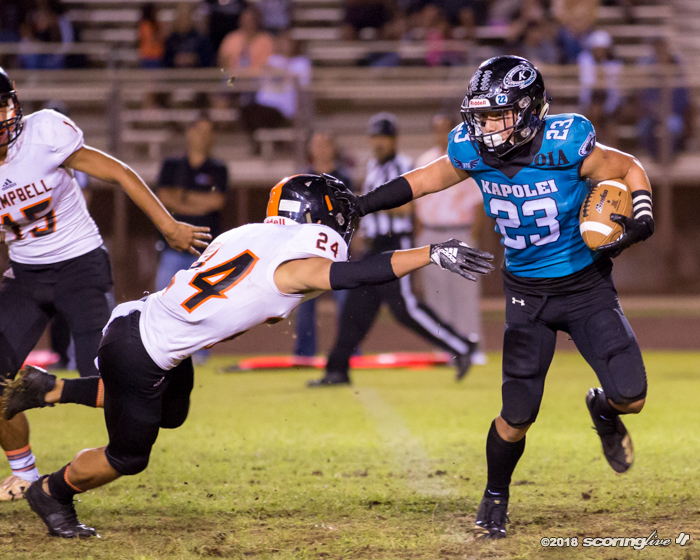 Kapolei will travel to Kahuku (2-2) next week. 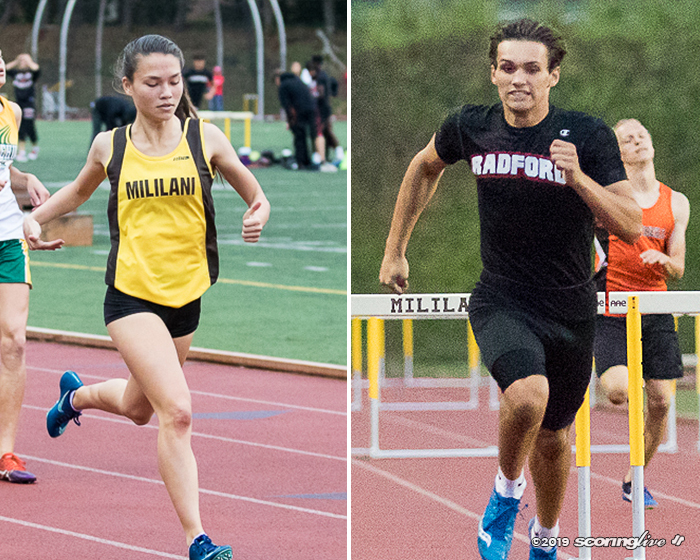 If the Hurricanes win, they will have the head-to-head tiebreaker on the Red Raiders for the third seed. 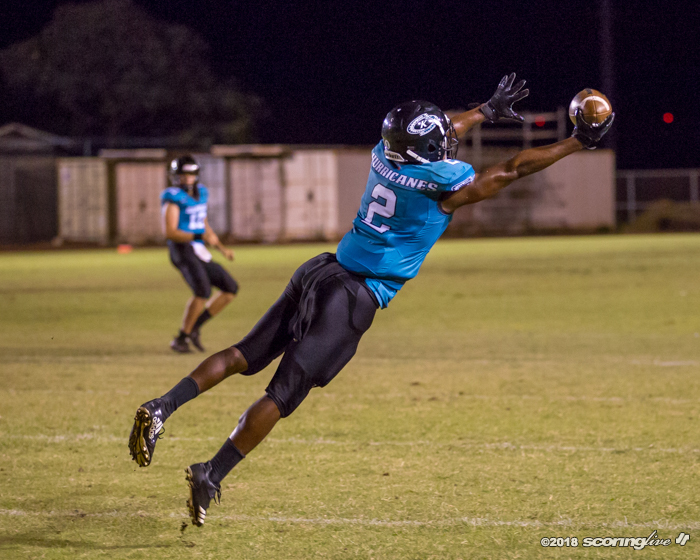 However, if Kapolei and Waianae both lose, each will be 1-4 and tied for fourth with Farrington. Each beat one, but not the other. 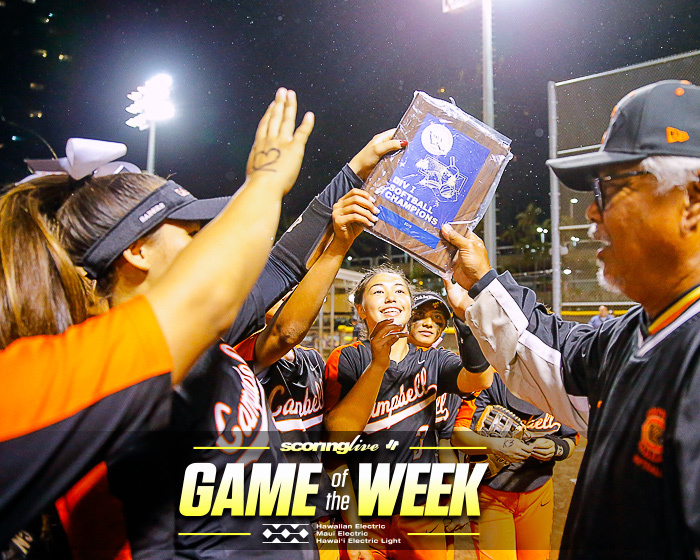 "We get to host," Campbell coach Darren Johnson said. 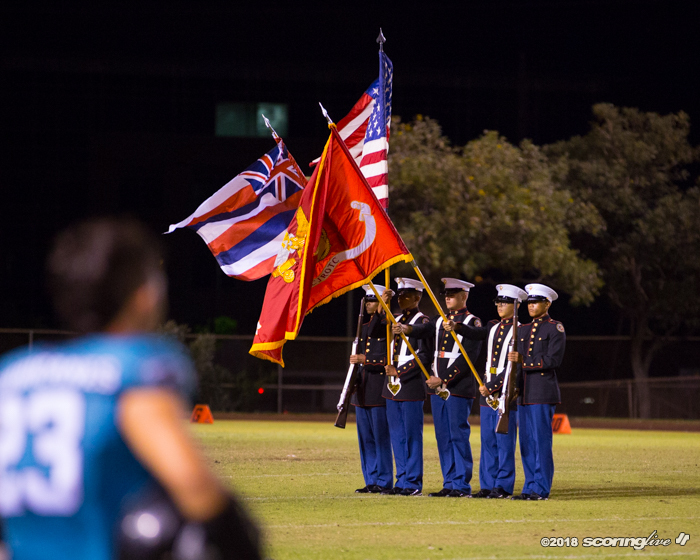 "But we still got Waianae left and we have to finish right and we have to make sure our kids are right and so forth. But not too bad. 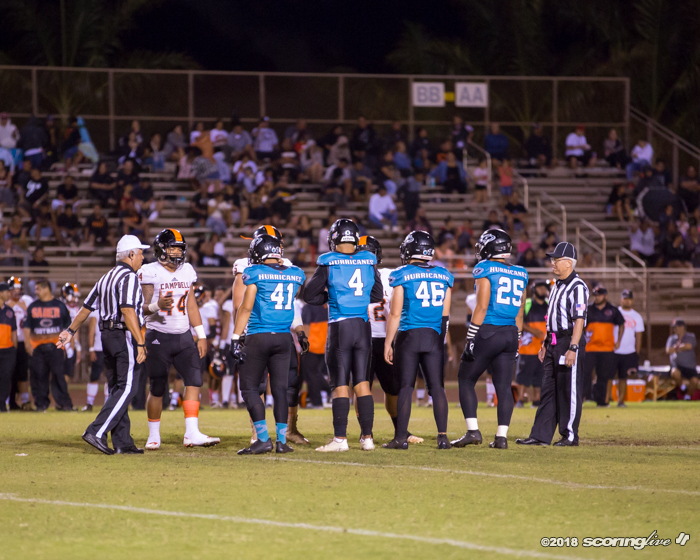 Our kids played some good football tonight, but we still made some sloppy mistakes, sloppy penalties and we have to get that corrected." 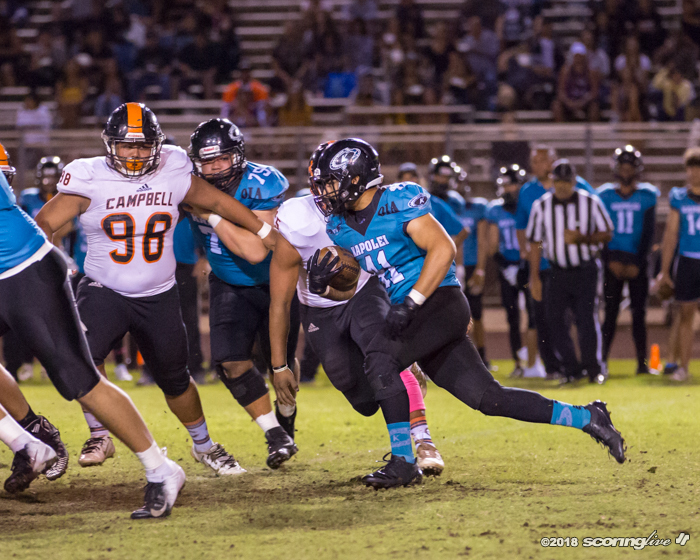 Campbell was called for 16 penalties totaling 150 yards; six of those penalties resulted in six of Kapolei's 15 first downs. 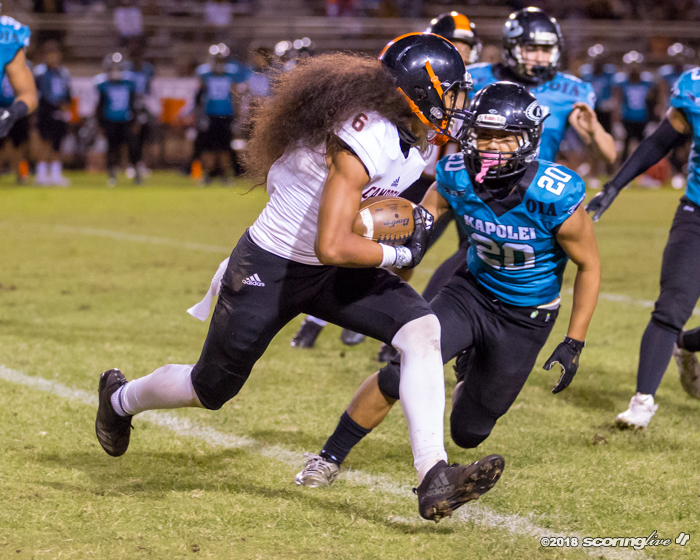 Offensively, Kaipo was hot, completing 19 of 27 passes. 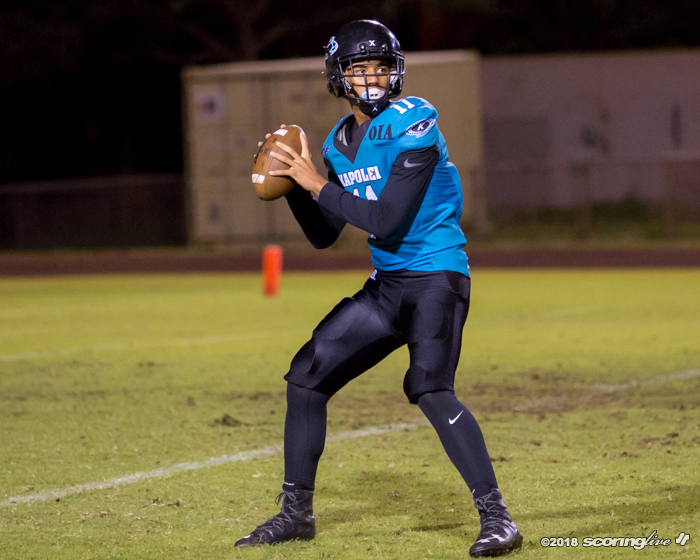 He threw TD passes of 69 and 12 yards to Titus Mokiao-Atimalala and 34 yards to Pokii Adkins-Kupukaa. 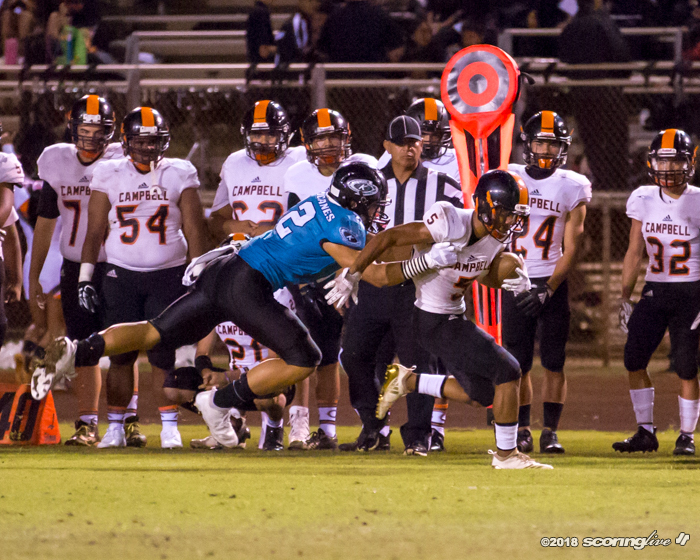 Running back Sky Lactaoen accounted for Campbell's other TD on a 2-yard run. 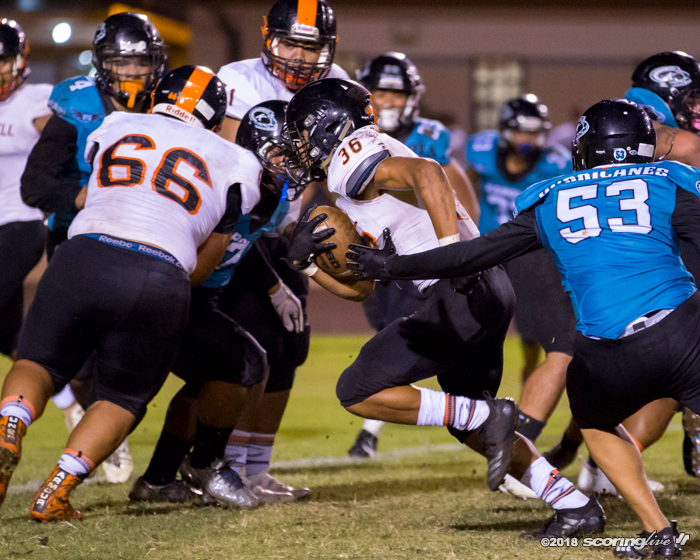 "He played good football," Johnson said of Kaipo. 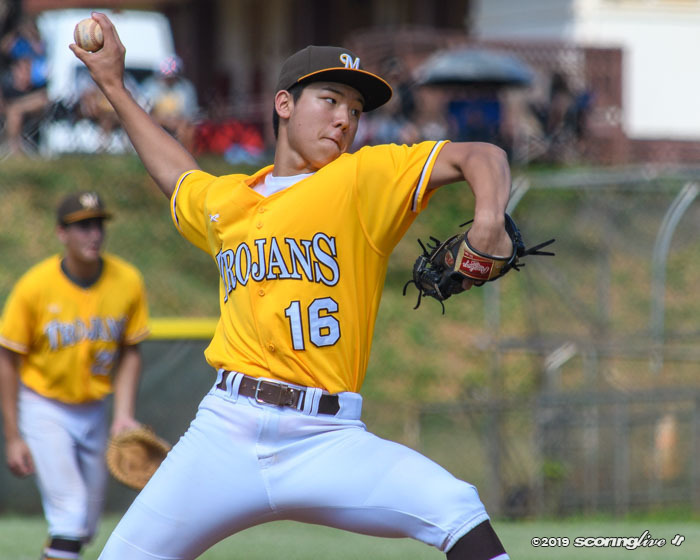 "He threw the ball good tonight. He came to play." 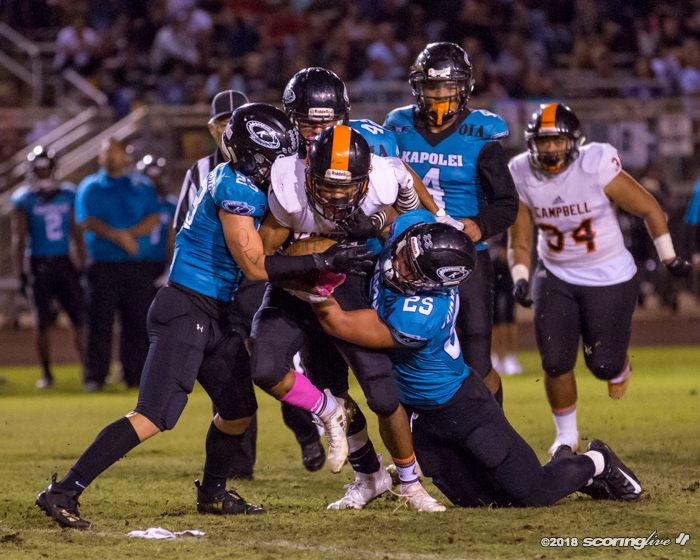 Campbell spoiled Kapolei's senior game, and inflicting the damage was Kapolei transfer Titus Mokiao-Atimalala, who had 10 catches for 169 yards and two TDs. 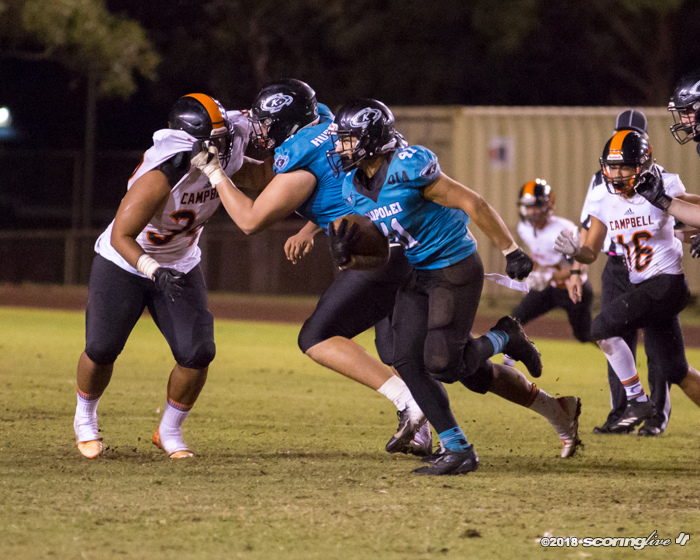 Brother Tamatoa had five receptions for 41 yards. 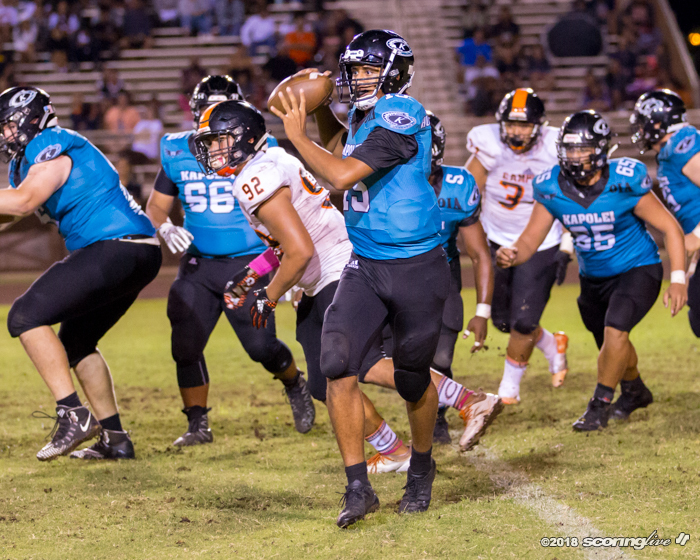 It was bittersweet for Kapolei coach Darren Hernandez. "It's hard," Hernandez said of watching the former Hurricanes. "I love those guys. They're great kids. 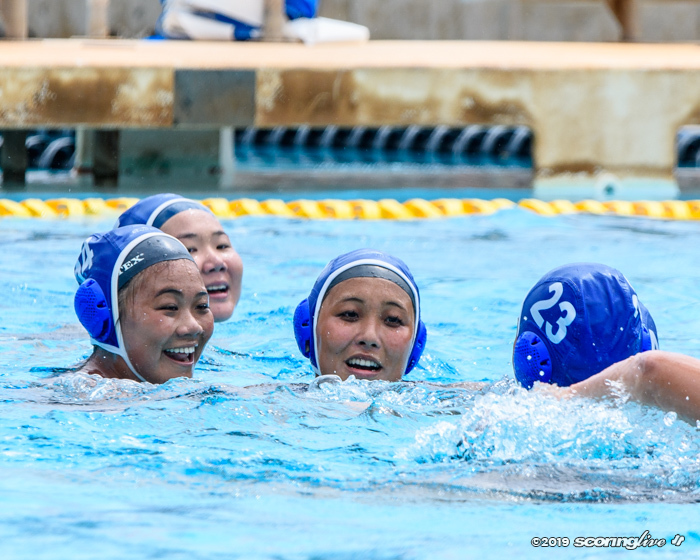 I'm not ashamed of my team." 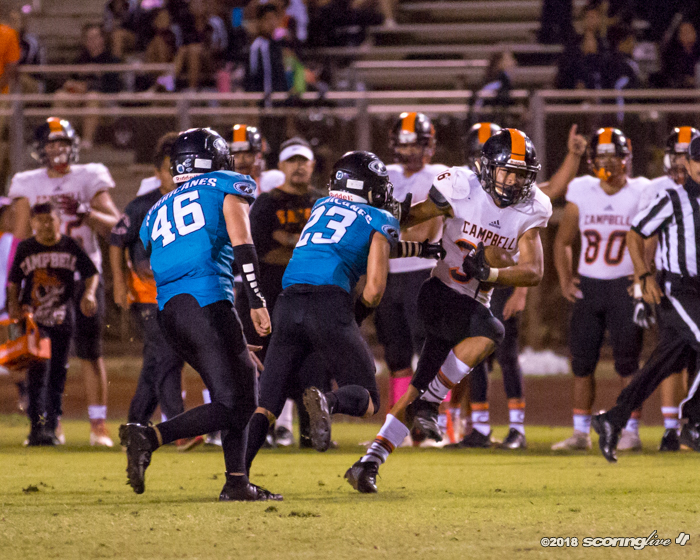 Campbell's experience at QB showed. 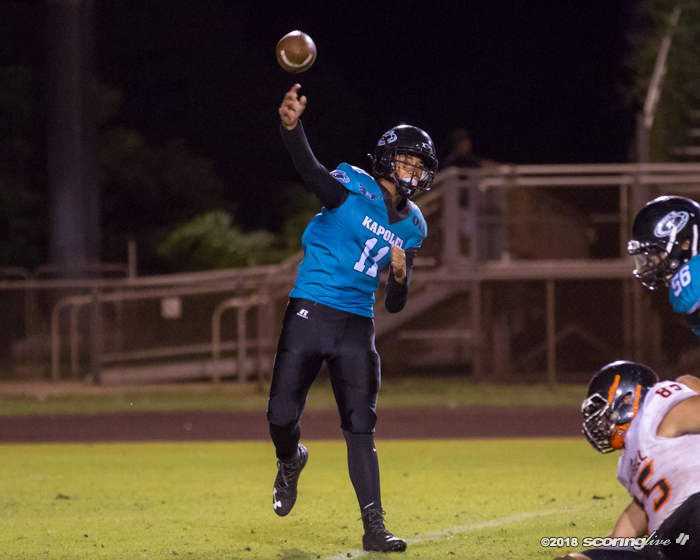 Kapolei's young QBs labored all game. 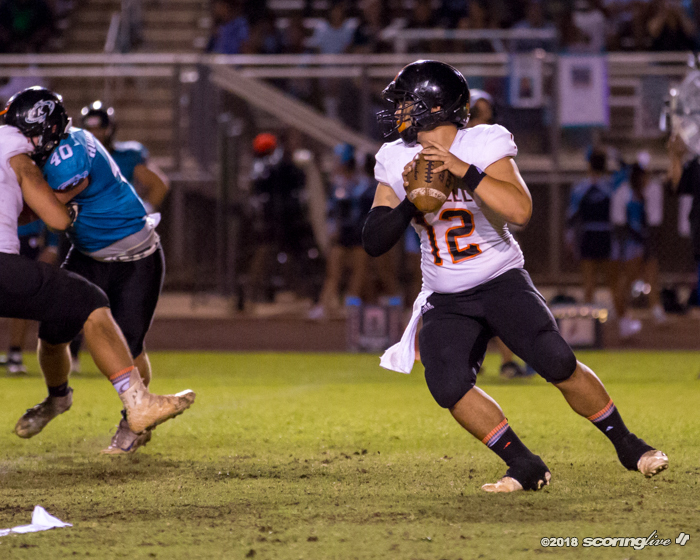 Sophomores Christian Rapis and Noa Bailey combined for 9 of 24 passes for 96 passing yards with each throwing an interception, both by Kaipo Enos-Ho. 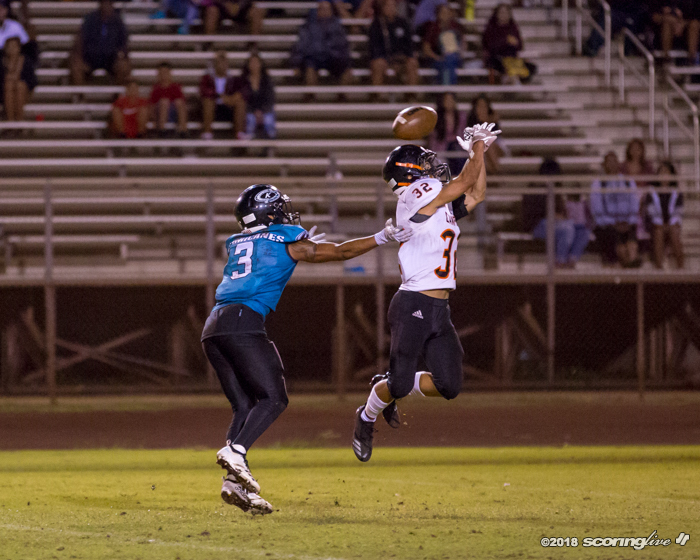 Freshman Mason Gomez also played, completing 4 of 10 passes for 35 yards. 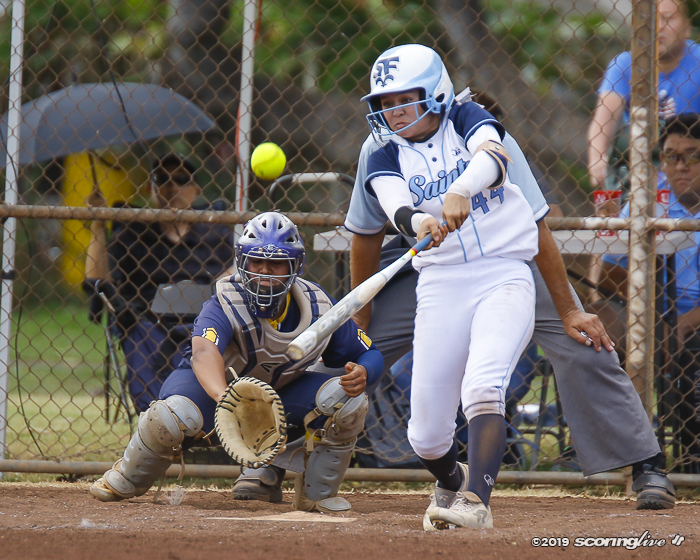 "We're not playing very well," Hernandez said. "We're not playing our best football right now. 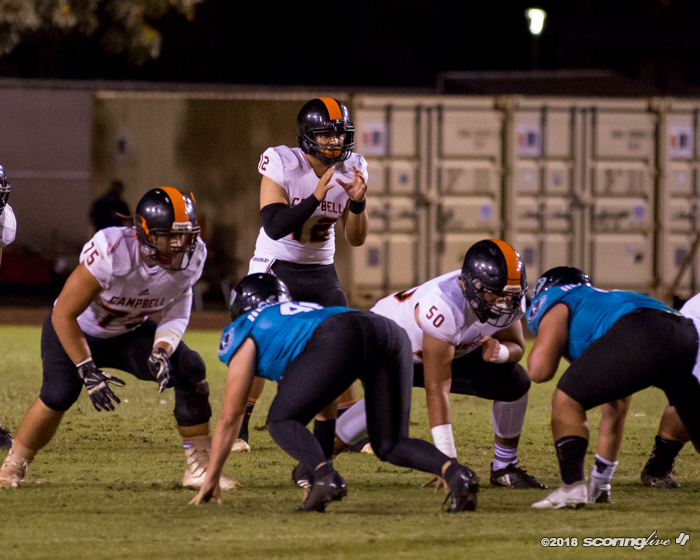 We're very good at stopping the run; no running back has gained a hundred yards against us. 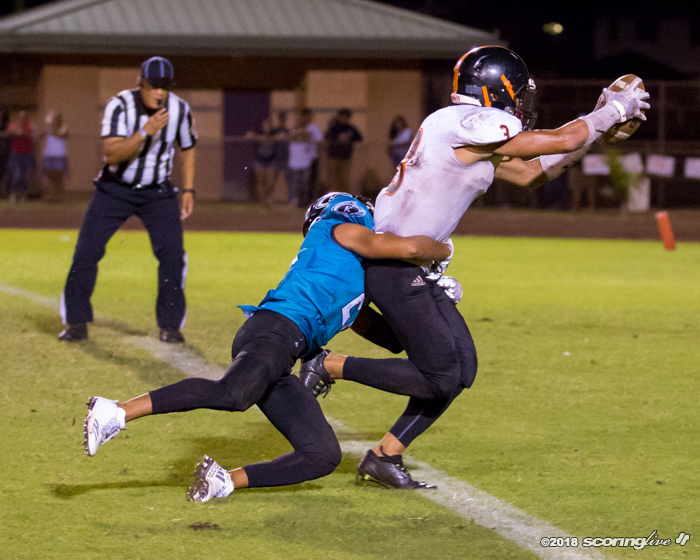 We're physical, we stop the run but there's other things that's going on. 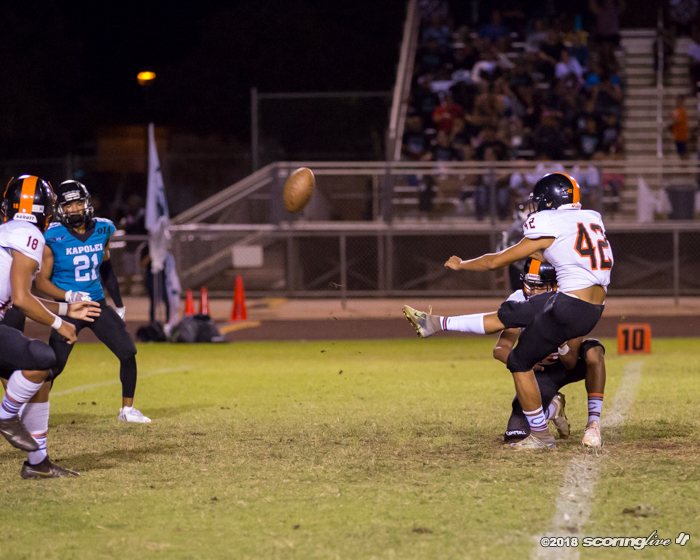 We're very inconsistent at quarterback. 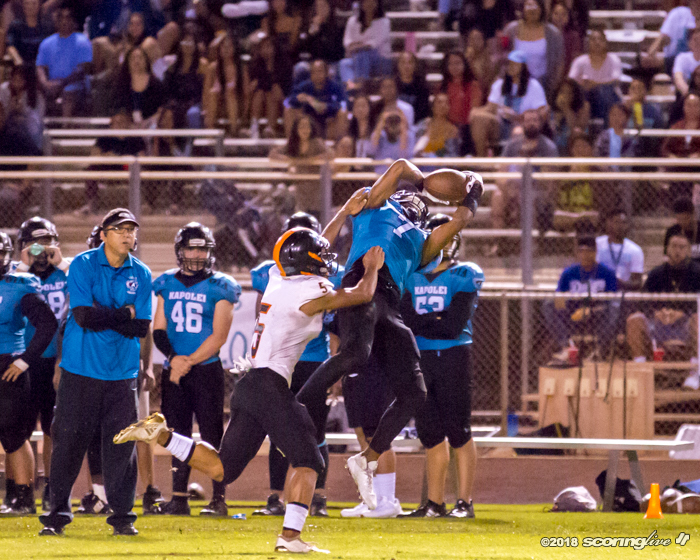 We had 10 dropped passes tonight. We had two dropped interceptions. 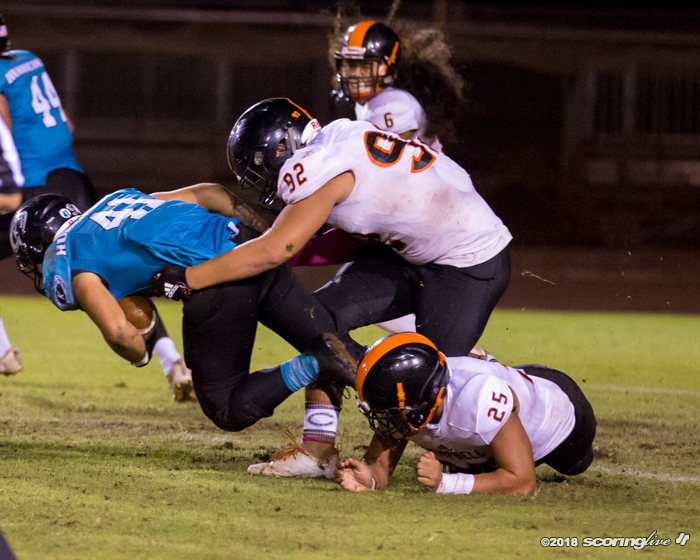 We had fumbles. 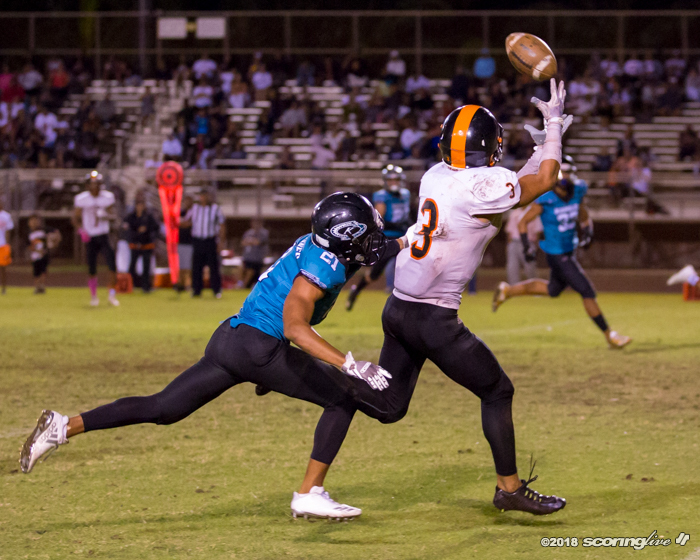 We're just not making enough plays to be competitive … Football is players making plays and they made more plays than us." Campbell wasted little time getting on the board. 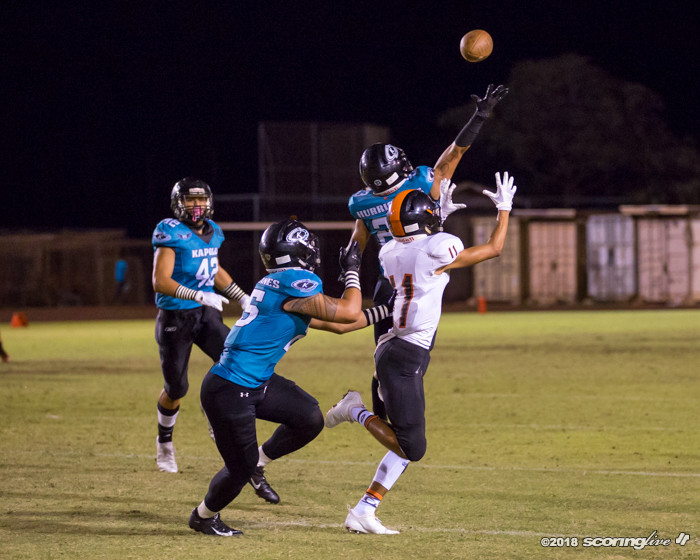 Kapolei punted after its first series and Kaipo hit Titus Mokiao-Atimalala on a sideline pass and the receiver just sprinted down the sideline for a 69-yard TD to gave the Sabers a 7-0 lead in the first quarter. 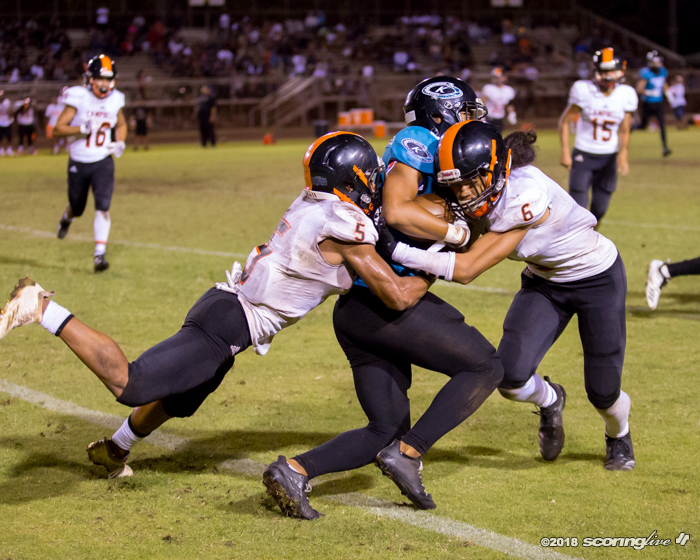 In the second period, the Sabers put together an 11-play, 81-yard drive that ended with a Lactaoen 2-yard TD run to make it 14-0 at the half. 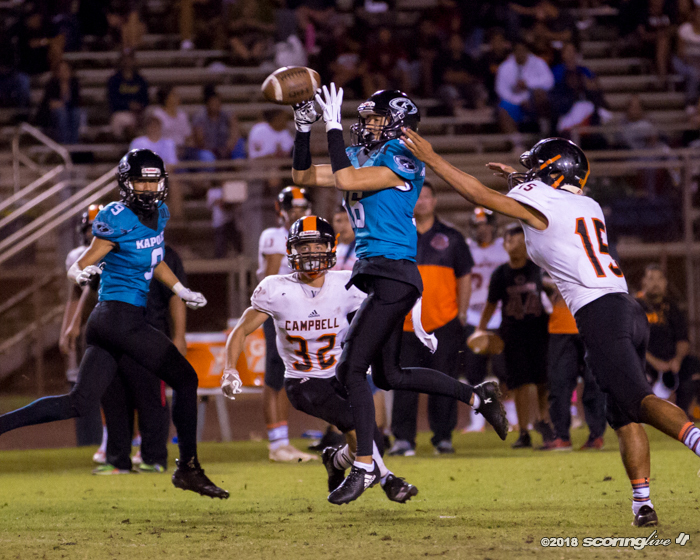 Campbell scored on its first drive of the second half with the aid of a roughing the passer penalty that came on an apparent interception by Kapolei. 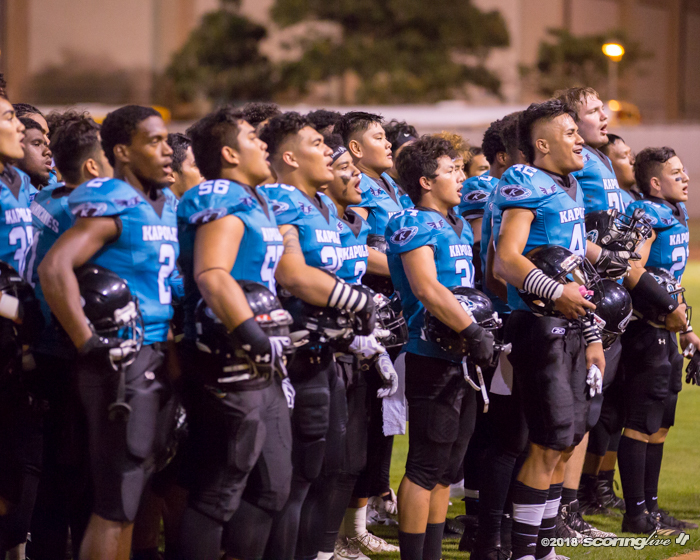 Instead, the Sabers got an automatic first downs and scored on Kaipo's 12-yard TD pass to Titus Mokiao-Atimalala to make it 21-0. 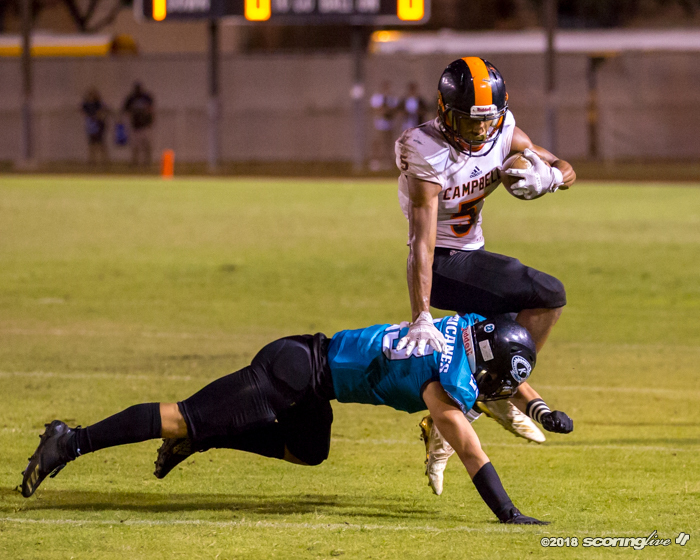 The Sabers closed their scoring on their next series on a 34-yard TD pass from Kaipo to Pokii Adkins-Kupukaa with 5:15 in the third period to make it 28-0.